Stilla veckan inleds idag med åminnelsen av intåget i Jerusalem. Jesus rider in i staden på en åsna, det minst kungliga man kan tänka sig. Ändå hyllas han av folkmassan som en befriare, som en kung. Folket kallar honom för Messias. ”Jesus is presented to us as the innocent victim of a group in crisis, which, for a time at any rate, is united against him. 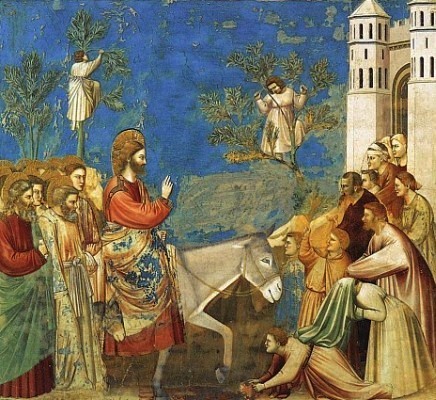 All the sub-groups and indeed all the individuals who are concerned with the life and trial of Jesus end up by giving their explicit or implicit assent to his death: the crowd in Jerusalem, the Jewish religious authorities, the Roman political authorities, and even the disciples, since those who do not betray or deny Jesus actively take flight or remain passive. We must remember that this very crowd has welcomed Jesus with such enthusiasm only a few days earlier. The crowd turns around like a single man and insists on his death with a determination that springs at least in part from being carried away by the irrationality of the collective spirit. Certainly nothing has intervened to justify such a change of attitude. It is necessary to have legal forms in a universe where there are legal institutions, to give unaniminity to the decision to put a man to death. Nonetheless, the decision to put Jesus to death is first and foremost a decision of the crowd, one that identifies the crucifixion not so much with a ritual sacrifice but (as in the case of the servant) with the process that I claim to be at the basis of all rituals and all religious phenomena. Just as in the ‘Songs’ from Isaiah, though even more directly this hypothesis confronts us in the four gospel stories of the Passion.